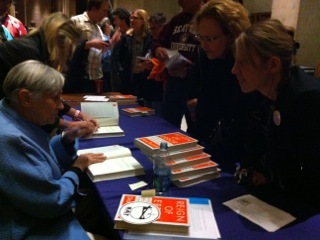 Chatting with Diane Ravitch after her talk in Kane Hall, at the University of Washington. She assured me that grassroots campaigns can be won! “Genuine school reform must be built on hope, not fear; on encouragement, not threats; on inspiration, not compulsion; on trust, not carrots and sticks; on belief in the dignity of the human person, not a slavish devotion to data; on support and mutual respect, not a regime of punishment and blame. To be lasting, school reform must rely on collaboration and teamwork among students, parents, teachers, principals, administrators, and local communities.